Ancient Italy. As I gazed out towards the horizon my imagination took hold and I couldn’t help but think of all the history in just this one scene. 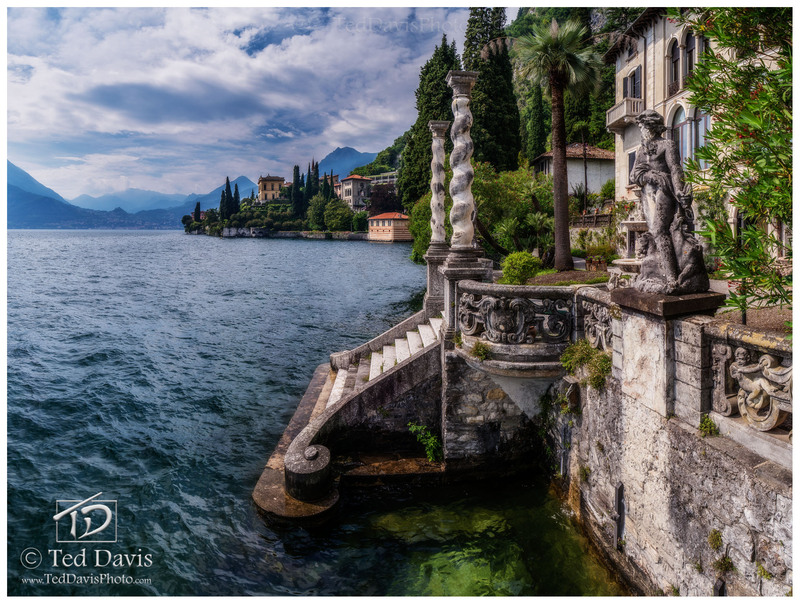 Nestled along the shores of Lake Como, I stood spellbound within the grounds of Villa Monastero. As I began to unpack my camera gear for a shot, I couldn’t figure out how to capture the scene as I needed to. With tripod in my hands, I decided to take a chance – either I’d get this shot or I’d get escorted out! Climbing out onto a balcony, I slipped over the railing and wrapped an arm around the corner column. With tripod in hand, I began setting up the legs to balance along the floor, railing, and column. Feeling the camera began to tip precariously towards the water I knew I had to somehow steady the camera while simultaneously snapping a large panoramic. Minutes dragged by as I focused in on my scene and finally began snapping shot after shot. Capturing the ancient history and beauty of Italy was important to me – and I had found the perfect shot. Photo © copyright by Ted Davis.